Word Toolkit is an add-in for Microsoft Word. It is the brainchild of Shauna Kelly. The add-in version available here was developed by Bill Coan in tribute to Shauna’s memory. You will find the special story behind this add-in in the More details section below. The add-in requires Word 2010 or later version on PC. The Word Toolkit add-in provides advanced tools for managing headers and footers in Word documents. 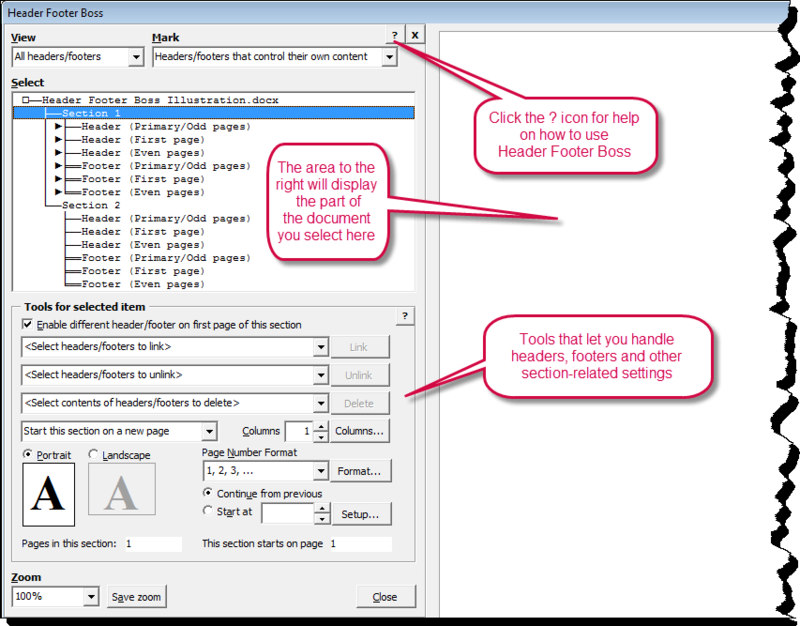 The tools can be accessed via a command, Header Footer Boss, from a custom tab, Word Toolkit, that is added to the Ribbon. The management of headers and footers in Word documents can be troublesome, especially in complex documents with many sections, different first page headers and footers, different page orientation, different column settings, etc. Header Footer Boss helps you keep track of everything. You have access to all headers and footers including related data from the Header Footer Boss dialog box - you can view, add, edit, delete, link, unlink, define page numbering, and much more. The Word Toolkit tab in the Ribbon with the Header Footer Boss command. The Header Footer Boos dialog box from where you can manage headers and footer. If you download, install and use Word Toolkit, then you will be taken to have accepted the License Terms for Word Toolkit. See below. If you use the software, then you will be taken to have accepted the following terms. If you do not agree to any of the following terms, then do not use, copy, transmit, or distribute the software. The software is provided "As Is", without warranty of any kind, express or implied, including but not limited to the warranties of merchantability, fitness for a particular purpose and noninfringement. Use the software at your own risk. In no event shall the author or copyright holder be liable for any claim, damages or other liability whatsoever arising in connection with the software or the use of or other dealings in the software. Copyright Shauna Kelly, Thendara Green Pty Ltd, 2011. The information below is an extract from About Word Toolkit that can be accessed via the Word Toolkit tab in the Ribbon once you have installed the add-in. The text was written by Bill Coan, the developer of the present version of the add-in. Word Toolkit is the brainchild of Shauna Kelly of Collingwood, Victoria, Australia. Shauna hoped that Word Toolkit would help all users make better use of Word. Tragically, she died at age 54 on 16 November 2011, leaving the software unfinished. Shauna's friends and family and other interested parties then joined together to bring Shauna's vision to fruition. Peter Grimshaw, Karl E. Peterson, and Rob Bovey helped gain access to Shauna's VB6 and VBA code. Tony Jollans, Jonathan West, Lene Fredborg, and Bill Coan analyzed the code and determined that very few persons would have sufficient knowledge of both Word and VB6 to carry forward Shauna’s VB6 code. They concluded that Shauna’s VB6 code should be ported to VBA, since many, many persons have knowledge of both Word and VBA. The Header Footer Boss was ported to VBA and brought to completion by Bill Coan. Additional of Shauna's tools may be ported and brought to completion in the future. If you would like to help with this effort, contact Bill Coan or contact Peter Grimshaw. Word Toolkit is licensed according to terms included in the download section above. Shauna Kelly had a quickness of mind, a clarity of thinking, a vividness of expression, and an openness of heart that won friends for her wherever she went. She went all over the world. Should you find Word Toolkit helpful to you and wish to honour her memory, then a donation in her name to the Ovarian Cancer Foundation would be her wish.